E-mail not displaying correctly? Click here to view it in your web browser. This report marks our second month of using new seasonally adjusted metro-area employment data from the Bureau of Labor Statistics. This data series is telling what has become a very familiar story. 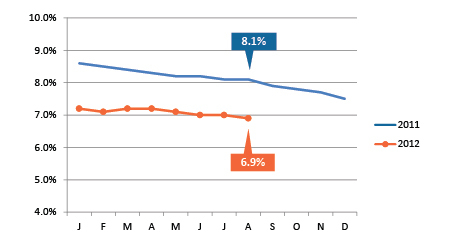 The highlight of this month's is undoubtedly the drop in the unemployment rate to 6.9 percent. This is the lowest it has been since late 2008. But, as the saying goes, the devil is in the details. Unfortunately, we didn't achieve this lower unemployment rate because employment growth outpaced growth in the labor force. That's what we would expect to see when the economy is growing and strong — which clearly does not describe our current situation. 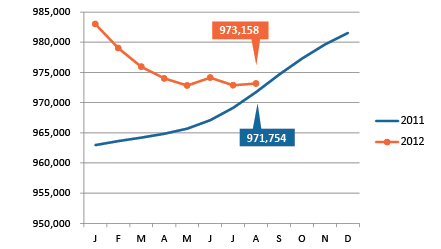 Local employment is actually up from a year ago, but only slightly, by 1,404. The labor force, however, is down by nearly 15,000. So our lower unemployment rate is really the result of a smaller labor force. The big question is why the labor force is declining. One common answer is that discouraged workers are dropping out of the workforce entirely as their unemployment benefits end. But another contributor to the shrinking labor force is one that economists have been anticipating for decades. We are just now beginning to see the first wave of baby boomers hit retirement age. If a large segment of the population is beginning to voluntarily leave the workforce, it stands to reason that we'll see a continued decline in labor force. This is an interesting situation, and one that we will analyze and report on in more depth in the coming weeks. Nov. 8, 9–11:30 a.m., Sylvester Powell Community Center, Mission, Kan.
MARC developed the Regional Workforce Intelligence Network to encourage greater collaboration among the region's workforce data and information professionals. RWIN is a collaboration of economic development professionals, one-stop centers, workforce centers, community colleges and universities that meets on a monthly basis. For more information, visit kcworkforce.com. Seasonally adjusted employment increased by just 293 in August. The region has added just 1,400 jobs compared to one year ago. The seasonally adjusted labor force declined by 1,400 in August and is down by more than 11,000 from one year ago. The metro area's seasonally adjusted unemployment rate dropped below 7 percent (to 6.9 ) for the first time since the end of 2008. 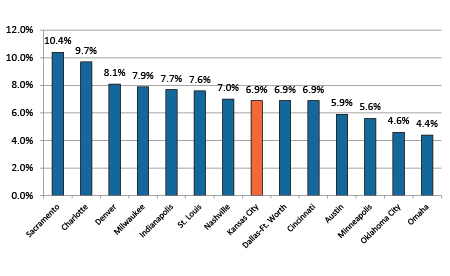 The Kansas City region's unemployment rate ranks in the middle of its peers at 6.9 percent. 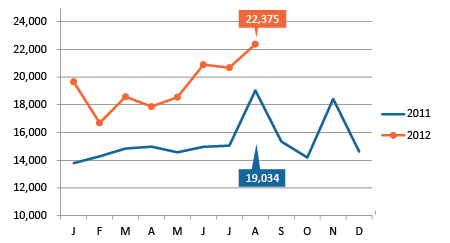 Job posting activity remains very high, with more than 22,000 jobs posted in August. In today’s global economy, innovation is the name of the game. Places that innovate create more jobs — and more higher-paying jobs. Innovation, however, is a difficult thing to measure. Economists often look at the number of patents generated as the best measure of a region’s innovative capabilities. In 2010, 545 patents were generated in the Kansas City area, ranking us 35th out of the 100 largest metro areas in the country. For a more accurate comparison, though, we would typically look at patents on a per-capita basis. With 2.7 patents for every 10,000 residents, Kansas City’s per capita total drops to 48th out of the top 100. In a recent blog on KCEconomy.com , author Victoria Ogier, workforce development project manager at the Mid-America Regional Council, summarizes a recent two-day conference on “The Future of Workforce Development” sponsored by the Federal Reserve Bank of Kansas City and the Federal Reserve Bank of Atlanta. Keynote speakers, experts and researchers discussed the changing worlds of economic and workforce development. Data sources: Kansas Department of Labor, Missouri Economic Research and Information Center (MERIC), The Conference Board and Wanted Analytics. Lafayette, Platte and Ray counties in Missouri.